We had a lovely summer holiday visiting my husband’s family near London. 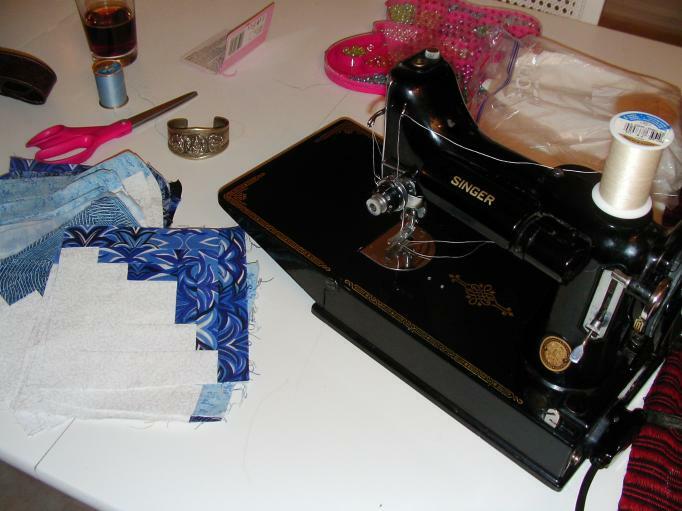 I took my Singer 221K (Featherweight) with me to sew in the evenings while the others were watching TV, and I got a good start on a blue and white Log Cabin quilt to donate to Alycia for the Quilts of Valor project. My beautiful Featherweight was manufactured in 1956 at the Kilbowie Factory in Clydebank, Scotland. She is called “Rosalie,” after my great-grandmother. I bought her several years ago from my local sewing machine repairman, and she sews a perfect stitch! Now that I’m sewing again, I’d like to start keeping track of my Stash Report again…if my group hasn’t kicked me out, that is! 😉 I haven’t bought any new fabric, but I have used a lot of blue strings from my scrap bins! welcome back – I was wondering if you had given up. Love the cheerful quilt in your header. Featherweights are wonderful for traveling – though the airport security guys usually take a second glance at the x-ray of it. You just have to be careful to stow all sharp things in the checked luggage! It’s good to see you back. I’ve noticed that our numbers have been dwindling but I thought it must be a summer thing. Thank you, Mary-Kay! It’s nice to be participating again! I am happy to see you back also. Miss reading about you. Love your picture. Looks just like the very dear person I used to see all the time.